Which Autosomal DNA Test Should You Take? The DNA testing marketplace continues to evolve rapidly. What would cost about $400 just 3 years ago can now be purchased for about $99. It is hard to imagine that this level of price cutting can continue. But wouldn't it be nice for us DNA junkies if they could? Not only could we take more tests. Many more potential cousins would add their information to DNA databases. Until FTDNA's just announced Sizzling Summer Sale, it was cheaper to take 23andMe's test at $99 and then transfer your downloaded raw data to FTDNA at $69 than it was to pay full $289 for Family Finder. Now that FTDNA has (at least for the next few weeks) reduced Family Finder to $99 this economic incentive may not be as strong. However, starting with 23andMe and transferring your data allows you to fish in both databases for cousins. It also allows you to take advantage of the analytical tools of both companies AND the health related information of 23andMe. FTDNA allows 3rd party transfer from Ancestry's autosomal data as well. However, FTDNA is the only company that accepts raw data from another lab test. It also is the only one that is now storing DNA samples for future testing. This can only be taken advantage of if FTDNA was the original tester of your sample. This is particularly important when the person being tested is elderly so that their sample is available for tests that may become available in the future. When you are on a limited budget, you need to weigh what you may learn from further analyzing your own genome vs what you potentially could learn from testing another family member. Y-DNA testing of a sibling (male) will generally give identical results as those of the first brother tested. With mitochondrial DNA testing this is true for siblings of both sexes. However, with autosomal DNA testing sibling testing does not give identical or near identical results. In general siblings share about 50% of their autosomal DNA. However, they can range from as low as 37% to as much as 63%. This is not critical if one is trying to match 2nd cousins or closer relatives. It does start to matter when one is seeking to find 3rd cousins or more distant relatives. When fishing for cousins in any company's database, you and any of your siblings will be almost certain (more that a 99% chance) to match a 2nd cousin. At the 3rd cousin level your chances (and those of a sibling) for matching someone in a given database are about 90%. At this level of cousinhood it is still likely that you will be matching most of the same individuals that your siblings match. However, at the 4th cousin level, you and each of your siblings will have only about a 50% chance of matching a particular individual in the database who is in fact a cousin. Your match list and those of your sibling(s) will start to vary considerably. At the 5th cousin level and more distant very significantly. Each of you will match with about 10% to 15% of your actual cousins in the database but many of them will be different individuals. Beyond 5th cousins you will still get lots of matches because you have so many cousins at this level. However, you (and a sibling) will each have a less that 2% chance of matching a particular cousin in a database. Since the matching efficiency declines down this slippery slope with each generation, it is important to test the oldest possible member of your family for best autosomal results. This is only marginally true with Y-chromosome or mitochondrial DNA testing. All of this is important to keep in mind when you are allocating your limited dollars and deciding which test to take AND which family member to test. 23andMe currently offers $20 off additional test kits when they are ordered at the same time. Happy testing and may you find lots of new cousins! By now you have probably heard about yesterday's US Supreme Court decision in the case of AMP v. Myriad Genetics. In that decision a unanimous court ruled that corporations could not patent a naturally occurring human gene even if they discovered its location in the human genome. The ACLU, which had brought the case to the court, used the following image to declare victory. That was a huge victory for those of us who are optimistic about the promise of personalized genetic medicine in which our own particular genetic make up is used to both diagnose and tailor treatment of our human disorders. After the decision was announced Myriad made a statement that other patents that it owned would maintain its position. These would include its proprietary database that allows Myriad to interpret the results of its BRCA testing. All of us who have taken genetic genealogy seriously have learned that that DNA results, taken by themselves, have little meaning. It is only when these results can be compared with a large number of other results can meaningful interpretations be made. Fortunately Myriad's statement, while perhaps technically correct, is somewhat misleading. Other labs are already stepping forward to offer alternatives to Myriad's monopoly supported pricing. What Myriad was charging about $4,000 for is now available at the drastically reduced price of $995 at a respected and accredited laboratory. Thanks to CeCe Moore, Your Genetic Genealogist for the heads up about the announcement of this breakthrough in affordability. In a press release picked up by the Wall Street Journal, the Houston based company Gene by Gene announced the availability of BRCA testing in the US that it had previously only been able to offer abroad. Many of you are already customers of Gene by Gene through its Family Tree DNA (FTDNA) tests for family history information. The developments of the last two days make BRCA testing much more affordable and probably is only the beginning of what competition in the marketplace will do to make genetic testing a routine part of our medical care. 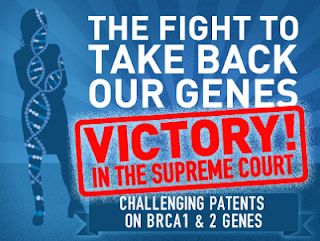 Thank you to the US Supreme Court for allowing us to own our own genes! Disclaimer: Although Dr D coordinates two Y-chromosome surname DNA projects based on results from FTDNA, he has no financial interest in the company. FTDNA has announced a limited time sale of transfers of your autosomal DNA test results from 23andMe (Relative Finder) and Ancestry. The advantages of so doing are primarily to allow you to "fish in another pond" for potential cousins who have tested at FTDNA but not at the service at which you have already tested and to be able to compare your all your matches with FTDNA's analysis tools. If you already have Family Finder results, you will gain only a very minimal benefit from such a transfer. Note below that earlier versions of 23andMe's Relative Finder test are not compatible with the upgrade process. See percentages of your ancestral make-up from 62 world reference populations such as Native-American, Middle Eastern (including Jewish), African, West and East European. Confirm close relationships regardless of gender. Please note, uploaded files are batched once a week then run through the conversion program. Results take between 6-10 weeks based on volume. You will be notified by e-mail when your results are available. *You will be matched with others who have also taken the Family Finder test. However, if you come from an under-represented population, it is possible that you will not find matches right away. Your matches largely depend on how your DNA compares to our database. As our database is constantly growing, we will send you e-mail notifications about any new matches calculated to be third cousins or closer. The 23andMe© V2 test, sold prior to November 24, 2010,is NOT compatible with our Family Finder product and is NOT accepted in the Autosomal DNA Transfer. ATTENTION: If you are already a Family Tree DNA customer, please log into your personal account to transfer your third party results and avoid creating a duplicate record. FTDNA has just announced a YDNA upgrade sale. If you or a close family member have already tested and you have been contemplating upgrading it to improve its precision, the following sale may be of interest. Since last summer's upgrade sale was such huge success, we thought we'd repeat history! We are offering discounts to our Y-DNA upgrade products just in time for father's day. So, please spread the word and we'll make this year's upgrade sale even bigger! we will reduce the following prices. your personal page with your kit number and password. BY 11:59pm, JUNE 19, 2013, TO RECEIVE THE SALE PRICE. The International Society of Genetic Genealogists (ISOGG) and the Southern California Genealogical Society (SCGS) have just announced that several presentations from Thursday (June 6th) program will be live streamed. These presentations will not be free but will be offered at a price considerably less than the price for those of us attending live. The line up is outstanding. These pay-per-view live streams are in addition to the free live stream events previously announced by SCOG from its Genealogy Jamboree which begins on Friday. These free streams cover a wide variety of genealogical topics. Only one of these sessions is on DNA testing. The full announcement, released overnight, is re-posted below for your convenience. The International Society of Genetic Genealogy (ISOGG) and the Southern California Genealogical Society (SCGS) announce that four sessions of the "Family History and DNA: Genetic Genealogy in 2013" conference will be live streamed on a pay-for-view basis and available for viewing by genetic genealogists around the world. "We are especially excited to be able to share four advanced-level sessions with our remote audience. We believe that these sessions will be of the most interest to those project administrators, DNA consultants and other more experienced users of DNA information," according to CeCe Moore, genetic genealogist, Southern California Regional Director for ISOGG and one of the speakers. "The cost of $30 per individual presentation includes the session's syllabus," continued Alice Fairhurst, president of the Southern California Genealogical Society and also a speaker at the event. "We are offering a special discount for those who purchase a Full-Day Pass at the discounted price of $100. Full-Day Pass holders will receive a digital download of the entire conference syllabus of 12 articles at no additional cost." TH004 - "Mapping Your Chromosomes with Autosomal DNA"
This presentation will describe techniques of doing chromosome mapping and triangulation using autosomal DNA results from 23andMe's test and Family Tree DNA's Family Finder test. TH008 - "Using Third-Party Tools to Analyze Your Autosomal DNA Result s"
Although DNA testing companies provide an analysis of test results, there are many third-party tools that allow test-takers to use those results to learn even more about their genomic heritage. TH010 - "Working with Autosomal DNA: Genealogical Case Studies "
atDNA holds endless potential for learning about your family history and what your ancestors may have passed on to you. Practical methods and examples from the presenter's research will be reviewed. TH014 - 4:00 p.m. to 5:00 p.m.
"The Changing Y-DNA Haplotree and Its Impact "
Learn how and why Y-DNA trees can differ and how the ISOGG team determines the location of SNPs on the tree. Find out how the most cutting edge SNP discoveries are unraveling the mystery of human ancestry. To register for the $100 Full-Day Pass, use this registration link. Those who select the Full-Day Pass will receive a digital download of the complete syllabus for the "Family History and DNA" conference. We are grateful that these outstanding genetic genealogists have agreed to shared their presentations via live stream. We hope that you will help us spread the word about this exciting program by tweet, blog post, email or even an old-fashioned phone call. Readers who are familiar with the SCGS Jamboree Extension webinar program will ask whether these sessions will be available in the Members-only website archive. The Bettinger and Janzen presentations will not be available at the speakers' request. The Moore and Fairhurst/Reynolds sessions will be placed online in Q3 2013. One other note: Jamboree is offering live-streamed video of several of the sessions on Friday, Saturday and Sunday. 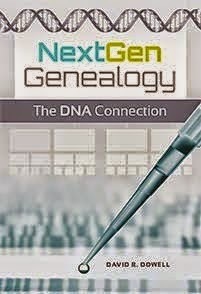 Thanks to the sponsorship of Ancestry.com, these sessions are offered FREE of charge. One of the sessions on Friday is the DNA Ask The Experts Panel Discussion with Joanne Mountain, PhD from 23andme; Ken Chahine from AncestryDNA; Bennett Greenspan from Family Tree DNA; CeCe Moore and Alice Fairhurst. This is an outstanding opportunity to view and learn without having to travel to "Beautiful Downtown Burbank."